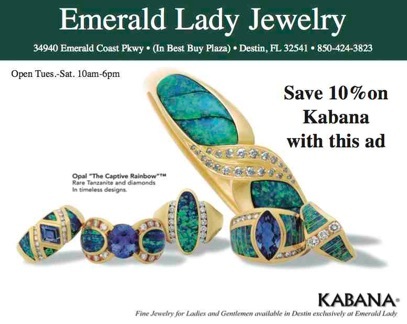 10562 Emerald Coast Pkwy., Destin. Located one mile west of Sandestin® Golf and Beach Resort on Hwy. 98. Open Mon.-Sat. 10am-9pm, Sun. 10am-6pm. Enjoy savings of 25% to 65% everyday at 110 designer and name-brand outlets including Ann Taylor, Calvin Klein, Coach, Cole Haan, J.Crew, Kenneth Cole, Michael Kors, Nike, Polo Ralph Lauren, Saks Fifth Avenue Off 5th and more. For complete information and to join the free VIP Shopper Club, visit premiumoutlets.com/silversands. 34940 Emerald Coast Pkwy., Destin. 800-999-6393. Located in the Best Buy Plaza behind Cracker Barrel on Hwy. 98. E-mail: emeraldladykw@aol.com. Open Tues.-Sat. 10am-6pm. Sea Life Jewelry, Australian Opal by Kabana, Larimar Jewelry by Marahlago, Gold and Silver Jewelry by Breuning, Swiss Watches by Classique, Ancient Coin Jewelry, Sterling Silver Bead Watches fitting all modular bead bracelets, Engagement Rings by Verragio, Demarco and the Romance Collection and Diamond Anniversary Bands. VISA, MC, DISC, AMEX, DC. Located in HarborWalk Village at Emerald Grande, Destin. Life is Good Genuine Neighborhood Shoppe features optimistic apparel and accessories featuring refreshingly positive messages and comfortable fits for men, women and kids. We have casual tees, lifestyle apparel, headwear, bags, home accents, beach gear, organic wear and more. Giving Life is Good products is a positive and unique way to spread the power of optimism. You’ve chosen the perfect spot for your vacation; now take the perfect memory home with you. Allow me to capture beautiful images of your family, wedding, birthdays or other special events. Our beautiful beaches provide the perfect backdrop for your session. Leave everything to me from posing to props and I’ll capture the wonderful memories that tell your story. Smart phone photos are good, but a professional photograph is something you will cherish forever. All sessions are on location from South Walton to Navarre Beach. New Location! 29 Eglin Pkwy., SE, Fort Walton Beach. Located a few blocks north of Hwy. 98. A new, bright, open-floor retail space featuring ladies’ swimsuits (including Meraki), quality beach dresses and tank tops, gift items, men’s t-shirts and swim trunks. We also carry beach accessories including a large selection of Costa sunglasses, flip flops and, of course, surf boards.VISA, MC, AMEX, DISC. 9818 Hwy. 98, Miramar Beach. 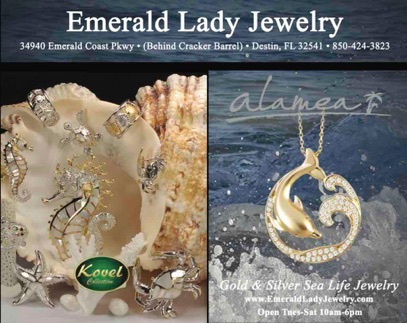 Located near Sandestin, 3 blocks east of Silver Sands Factory Stores. Open Mon.-Sat. Closed on Sun. The Best Little Shop on the Beach for 35 years. 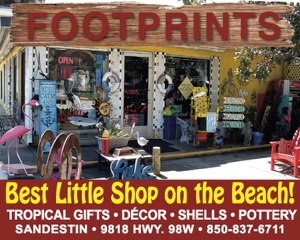 A beach-themed store carrying tropical gifts, shells, condo accents and more. VISA, MC. Destin: 34 Harbor Blvd. (located in HarborWalk Village at Emerald Grande). Fort Walton Beach: 1450 Miracle Strip Pkwy. (located in the Boardwalk on Hwy. 98 on Okaloosa Island between Ramada Inn and Gulfarium). Summer hours: 9am-10pm daily; Winter hours: Sun.-Thurs. (10am-6pm), Fri.-Sat. (10am-8pm). 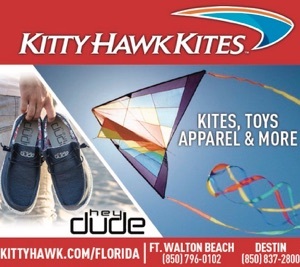 Kitty Hawk Kites offers the area's most unique selection of kites and kite accessories, wind art, clothing and apparel, footwear, toys, gifts and more. Kayaks and paddleboards are also available for sale and rent at the Destin location.